Prepare to cast your agency’s vote! 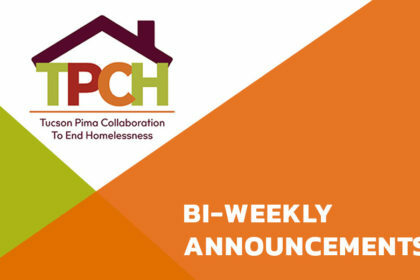 Collaborative Applicant (CA) staff earlier this week emailed TPCH members a reminder of – and background materials for – a Special TPCH General Council on March 12, 3:00 pm, at the Pima County Housing Center. If you did not receive this email, email tpch@communitypartnersinc.org immediately to request a copy. Copies will be emailed through 5 pm Monday, March 11 and available in print at the meeting. There are two very important main topics. • How should TPCH proceed (with FY 2019 Continuum of Care Notice of Funding and a CA) in response to the City of Tucson Letter of Intent and subsequent Questions and Answers in response to our request for information for entities wishing to be our new CA? • Should TPCH adopt a new, more inclusive but streamlined Board structure that replaces one-third (instead of half) of voting Board members each year? Please review the forwarded materials carefully, discuss with your leaders, and come prepared to discuss these questions and cast your agency’s vote! 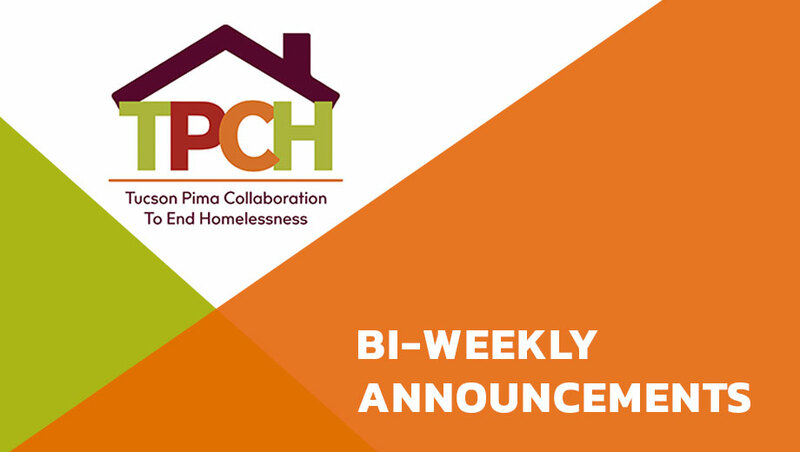 TODAY: Governance & Planning Committee – 8:30-10 am, Sullivan Jackson Employment Center, 400 E. 26th St.
Special General Council Meeting re: Collaborative Applicant – Tues., March 12, 3:00-5:00 pm, Pima County Housing Center, 801 W. Congress St. Performance Evaluation and Monitoring Committee – Wed., March 13, 9:00-11:00am, Sullivan Jackson Employment Center, 400 E. 26th St.
HMIS Committee – Wed., March 13, 3:00-4:30pm, Southern Arizona AIDS Foundation, 375 S. Euclid Ave. Coordinated Outreach Subcommittee – Thurs., March 14, 9:30-10:30am, American Red Cross, 2916 E. Broadway Blvd. Governance & Planning Committee – Fri., March 15, 8:30-10:00am, Sullivan Jackson Employment Center, 400 E. 26th St.
Continuum of Services Committee – Tues., March 19, 8:30-10:00am, Sullivan Jackson Employment Center, 400 E. 26th St. Performance Evaluation & Monitoring Committee – Wed., March 20, 9:00-11:00am, Sullivan Jackson Employment Center, 400 E. 26th St. Coordinated Entry Committee – Thurs., March 21, 1:30-3:00pm, Pima County Housing Center, 801 W. Congress St. Governance & Planning Committee – Fri., March 22, 8:30-10:00am, Sullivan Jackson Employment Center, 400 E. 26th St.
Board of Directors – Tues., March 26, 3:00-5:00pm, Pima County Housing Center, 801 W. Congress St.
El Rio Community Health Center’s newest facility – and homeless clinic – are open at 1230 S. Cherrybell Stravenue (at the Kino Parkway intersection). Services for all veterans – and respite housing for homeless veterans only – will be provided at the Grand Luxe Hotel, 1365 Grant Road, March 13-15, during the annual Veterans Stand Down. TVSV still seeks volunteers to work starting March 12. Please copy and circulate the attached volunteer, full and quarter-page flyers. Taxes trying you or clients? Evictions: What can we do? Join the community conversation! See and post the attached flyer. Read Evicted… and the join its author, Matthew Desmond, and local experts for a panel discussion on March 21.